Director Lori Kaye on Kevyn Aucoin's Legacy and Her Doc "Beauty & the Beast in Me"
In the '90s, Kevyn Aucoin was the most dominant make-up artist in fashion, transforming his role from behind-the-scenes artist to a household name. Aucoin took beautiful faces—like Cindy Crawford, Naomi Campbell, Gwyneth Paltrow, Liza Minnelli and more—and made them transcendent, and his work could be seen on fashion runways, magazine covers, and Hollywood award shows. He launched his own line of beauty products and released three iconic books on the art of make-up. Then, in 2002, he died from kidney and liver failure brought on by prescription medications, which he had been taking in increasing doses to deal with pain caused by a pituitary tumor. Documentarian Lori Kaye knew Aucoin, and was moved to bring his story to the wider world. Her film, Beauty & the Beast In Me, premiering tonight on Logo, examines Aucoin's life from his troubled childhood in Louisiana where he was bullied for being gay, to his move to New York and quick rise to the heights of fame. Kaye's doc features interviews with Aucoin's family—including his father and birth mother who gave him up for adoption—and famous friends like Andie MacDowell, Amber Valletta, Gwyneth Paltrow and more. But Kaye's documentary features one more special voice—Aucoin's own. He shot hundreds of hours of videos of his life, from backstage at shoots to family functions, to personal time alone. Kaye incorporated this stunning archival footage, allowing Aucoin, in a way, to tell the story of his own life. We hopped on the phone with Kaye to talk about discovering all those old tapes, Aucoin's magnetic personality, and her favorite moment she discovered in the footage. One of the keys of Beauty & the Beast in Me is that it's built on all of this documentary footage that Kevyn Aucoin himself shot. It was quite a feat to figure out how to craft it into a story—to use it to the best of its advantage to tell his story. There was a lot and people were blown away by it. People were seeing that footage and going, oh my god, no one did this. Nobody made this happen. It's rare. It's history. It is fascinating—and amazing how much there is and how candid and open everyone is, including celebrities like Cindy Crawford, Gwyneth Paltrow, Andie MacDowell. Right. Now, everybody has their video persona all ready to go, all packaged and branded—famous or not famous! In these, I started seeing the way everyone was. And the hairs on my arms stood up. This is so in the moment, it's so intimate, it's so unrehearsed and candid and genuine. It is the highest echelons of the fashion world just…eating a bagel! Hanging out, working. Doing makeup, doing hair, hanging and being who they were. Just being friends and laughing. You get a real sense of this time—it was such a beloved time in fashion history, and you get a real sense of why perhaps it was. Because when you see how they were, that translated, I believe, to every photo that got taken, to the designs, to the covers. I feel like it just got translated there. Now everyone is used to sort of behaving like this, recording every detail of our lives and spreading it on social media. I think he would have found a way to go beyond it. To go beyond what we do now. And would have talked everyone into it. He would have talked everyone into doing what he needed them to do. I've looked at all the footage from the moment the camera gets turned on to the moment camera gets turned off, and it's like Kevyn's home videos. And then there was the personal stuff. There were hundreds of hours of birthdays and Disney World and hanging out and being goofy and dressing up in drag. And then for me, just to be watching a randomly labeled tape—it didn't say, "Going to see my birth mother for the first time." To see it happening, it was like, oh my god, you are meeting your birth mother for the first time, and you shot it. How did you discover this trove of tapes existed? I knew Kevyn when he was alive. I was doing a documentary series about people in fashion, and I spent time with him and would shoot with him at his apartment in New York and while he was doing the book Making Faces. I went with him to Lousiana and met his family while I was there and formed a relationship with his dad. And when Kevyn passed away, I, like so many people, was very sad and shocked. And after that I felt strongly compelled that I needed to bring his story to the world, to tell it to everyone. As I began that journey, somebody said to me, "You know, there's all these tapes." I remembered, when I was with him, he was shooting me while I was shooting him. When we went to Louisiana, he got the key to the city from the mayor, and I'm looking at the footage that he shot of that and there I am. He had a big party when he started writing his column in Allure, and I was shooting that party. And then I'm looking at his footage and there I am, asking Janet Jackson a question. It was tucked away in storage and when I saw what was there…I wasn't prepared for what it was. Hundreds of High 8 tapes, hundreds of little DV tapes, and then those tiny answering machine tapes. Randomly labeled: Liza, Linda, Naomi, Disney World. I went online and I went on eBay and I bought an old High 8 tape recorder and started to play it back and look at what was there. There's so much footage, it's like, what do I do with all this? There's no way to know what's in there unless you sit down and watch it and make a log of every tape that exists and know that footage backwards and forwards. And there's hundreds of hours. Kevyn is a famous figure, and his story is fairly well-known. How did you decide to structure the documentary, and what did you decide to focus on? Kevyn was never quiet or shy about his story of being so horribly abused and bullied growing up, and having to quit high school and coming to New York. So that part, in many ways, was a given. It's something we have to explore and share with people who may not know about it. But beyond that I was compelled to understand and figure out—and look, Kevyn is a multilayered person, so for me it was to find out what was underneath the obvious stuff. And I feel like Kevyn's adoption was something that played into every aspect of who he was, and hooking into that and figuring out where that played out all along the way, that was how I was able to figure out what the through line might be. This is a person's life—and he shot it for me. Someone said to me, "Why do you think he shot all that footage?" And I've thought about it a lot. I've asked people about it. I just think he wanted people to see it, to see his story. For me, it was fulfilling that idea. Let's just get everybody to see it. I had all of this crazy, fabulous footage. I couldn't just leave it in a drawer! Was there any particular tape or moment that really knocked you out of your seat? There were a lot of things I was just like, oh my gosh, I couldn't believe. I was looking at a tape that just said "Disney Land" on it, and it was Magic Mountain on the tape, again and again. They're going on the ride again! And it would be a bit tedious. And then suddenly, Whitney Houston came popping on. It went static, and then there was Whitney on the set of "My Name Is Not Susan." And it was like, what?! Whitney! It's WHITNEY! And to see her so young and beautiful and he had done her makeup so beautifully, and to see her happy and sweet. It was kind of mind-blowing. To see Liza so, in those moments, in some ways like a young Judy. Just so beautiful and laughing and having a wonderful time. And yes, finding his birth mother and seeing her for the first time, that was beyond a documentarian's dream, to have what is probably one of the most important moments of his life be there on camera. 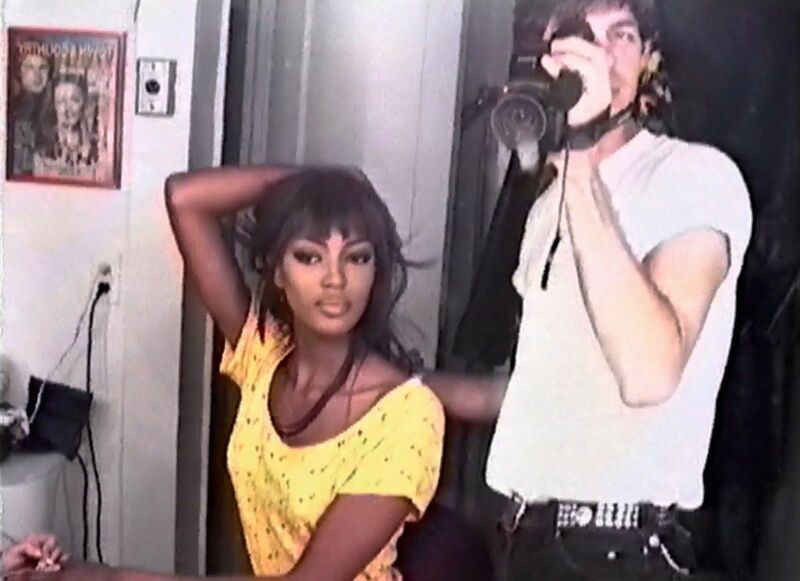 I could sit and watch Naomi Campbell doing the hula and hanging out and Linda Evangelista and Cindy. I could just watch that raw footage for hours myself. It's not so easy! It takes a lot. I have to say that the way that happened was through personal relationships. I have to shout out to Cindy Crawford. I got on the phone with Cindy after a friend of a friend introduced us and when told her what I had she was blown away. And she was like, "Of course I have to see what's in there." And on that first phone call she was like, "How can I help you?" And it was like, wow—you're the real deal. And she helped me, she went and got a few people. It was really wonderful. I have to thank a lot of people who helped me get people in boat. There were a lot of fabulous moments, but Aucoin's story, particularly surrounding his death, that might be a little more painful and difficult to get people to speak on. Did you ever have any trouble getting your interviewees to discuss certain things? For the most part, everyone who was involved with this film wanted an honest, genuine story, including Kevyn's father, who said, "I want the truth. I want it to be true and I want it to be genuine." I went to Louisiana and I showed him the film and he said, "I think everybody should see that movie and it should teach you don't turn away from your children." But I think people that sat down wanted an honest portrayal, so they were open to talk about the truth. And his ending is a complicated ending. His passing is complicated by more than one story. I'm thankful to them for being honest about it. Images courtesy of Putti Media.